What a great way to kick this series back off. The injokes are stong with this one. The opening and ending are great, maybe not as catchy as season one but they are growing on me fast. Cute and clever, this show never fails to deliver the laughs. Sure it’s more of the same from last season but that’s exactly why I’m excited for it. There’s nothing wrong with Yuruyuri. It’s very competent cute girls doing cute things anime. I even laughed once or twice. There were a couple of clever jokes. None of that prevents this from being a giant, all consuming black hole of unoriginality, sucking in any inspiration, cleverness or pretense that this anything other than g rated otaku fap fodder. The stunning laziness of the writing is equalled only by the amazing creepiness of watching children flirt with each other for your amusement. It’s the anime equivalent of junk food – it’s acceptable while it lasts but the moment it ends you’ll forget all about it. Wait, was I meant to be previewing something? I did not watch the first season of this anime and I think if I did I would have ended up in a mental institution. This terrible anime featured a segment of a terrible anime within a terrible anime and please don’t make me watch anymore for the love of God. I actually went pretty far in the first season of YY, but it went into the class of show that I would drop in the middle of the season because there really was no investment keeping me tied to it. It was enjoyable somewhat, it had its weird lesbo shtick down pat and it was comfortable as a safe yuri parody. It always got awkward when I thought about how these characters are supposed to be 13-14 but I guess that’s just one of those things with certain anime where you have to not think about it too hard. There were some good jokes but it’s no Azumanga Daioh or anything. I might give another few episodes like I did last time it aired but if you didn’t like it before you probably won’t like it now and if you did like it then, more power to ya. Or lesbians. Both I guess. So, uh, well… There are a bunch of girls. They like each other maybe a little too much. It is also quite funny. Verdict? It is the second season of YuruYuri. Chances are you know if you like this show already. It knows exactly what it is doing and it is pretty damn good at doing it. If you are anywhere near the fence, give the first ep of the first season a shot and go from there. While I thoroughly enjoyed the first season of YuruYuri, I have to agree with Zigg. The first half of this season première was cheesy, idiotic, repetitive and even a bit grating, but the intentionally obnoxious execution and the way in which it reintroduced the characters and their quirks was a small stroke of genius. The second half, however, brought things down to earth and thus, mediocrity. Same old characters, same old jokes, and no attempt whatsoever to twist the same old tropes around a bit. The first part was a step in the right direction, but the second part a recipe for disaster. More of the former, and less of the latter please, or else this second season will stand out even less than Akarin. 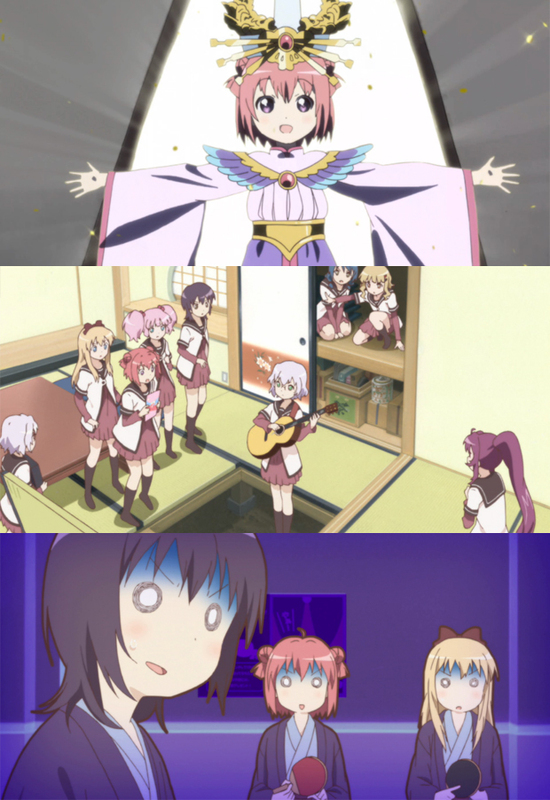 First Look: Yuru Yuri Third☆Season!